Rumors have been floating around for quite a while. 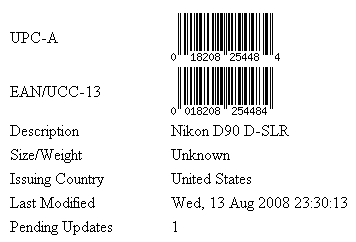 Now there is some evidence that the Nikon D90 is coming. Apparently someone (as reported by Engadget) has found the D90 in the UPC database. Posted in Digital SLR Cameras, Rumors on August 14th, 2008. No Comments. Nikon D3 and D700 can switch between DX (24x16mm) and FX (36x24mm) modes to accommodate different lens formats. If “Auto DX Crop” is enabled, the camera will automatically adjust the picture angle (field of view) to DX format when a DX lens is attached, and to FX format if a 35mm format lens is attached. Posted in Digital SLR Cameras, Tips and Techniques on August 3rd, 2008. No Comments. This is definitely not the typical hands-on preview/review you’d expect for a high tech photography machine. The review actually shows you some glamour photos with real hands holding the latest Nikon FX format (full frame) digital SLR camera to compliment its verbiage. I guess the editors are trying to attract some viewers with this creative review format in the crowded photography review market, but for credibility’s sake, they should at least spend some time coaching the pretty model so she knows where the shutter release button is. Pull your attention back a little from other parts of the photos, you will notice the awkwardly placed finger in a couple of places. To be fair, the DigitalRev review isn’t bad at all. Without all the technical details overloading your brain, you may actually find it concise and refreshing. Posted in Digital SLR Cameras on July 27th, 2008. No Comments. Posted in Digital SLR Cameras on April 23rd, 2008. No Comments. It has been a while since Canon announced the 450D / Rebel XSi. DPReview editors got their hands on a production version of the new DSLR camera and posted a gallery of sample images. Nothing looks very striking from those sample photos, but the Canon 450D will be a great choice as an entry level digital SLR camera with many improvements over its predecessor and good value. Posted in Digital SLR Cameras on March 21st, 2008. No Comments. After a long delay, DPReview has posted a very detailed review of the Nikon D300 digital SLR (DSLR) camera. Against some strong competitions, the D300 easily earned a “Highly Recommended” and the review states “… biggest problem writing this conclusion has been picking out the D300’s weak points” and “… there’s simply no better semi-professional digital SLR on the market“. If you are still hesitant on buying the D300 for whatever reason, the review may finally help you make the decision. Posted in Digital SLR Cameras on March 13th, 2008. 1 Comment. I have one of the older model (A16N) Tamron SP 17-50mm f/2.8 for Nikon. I like the lens for its value even though it does have a flaw related to FLASH photography in TTL-BL mode. Lately, Tamron has announced update to this lens with a built-in AF motor. No screw drive hole for AF. AF motor is now built-in. This makes the lens compatible with Nikon D40, D40x, and the new D60 DSLR cameras. AF/MF switch. It is no longer needed to set the focus mode on camera. I doubt it can do focus override (typically only on AF-S lens) though. Smoother but much lower AF. I hope it can provide more precise auto-focus and the accurate distance information to the camera so the old problem can be avoided. Posted in Digital SLR Cameras, Lens on March 4th, 2008. 1 Comment. Once a very popular lens selling even above MSRP not too long ago, the Nikon AF-S DX VR Zoom-Nikkor 18-200mm f/3.5-5.6G IF-ED has lost its charm somewhat. I guess the demands drop as most people who wanted it already got it. It can now be easily found at most photography equipment places for less than MSRP. It appears that DPReview just started doing lens reviews but I am a little surprised to see the review of this lens coming from DPReview at this time (two years after its release), when many people are waiting for an already-late Nikon D300 review. Based on the review, the lens is “about making some optical compromises to provide the broadest possible range in a single lens”. It is “nothing more than an expensive snapshot lens”, and it is for “he photographer who wants to shoot a little bit of everything and not have to change lenses”. I guess that’s quite accurate. Posted in Digital SLR Cameras, Lens on February 26th, 2008. No Comments.